If you’re like most small business owners, you’re not marketing because you love marketing. You’re marketing because you know that your business or nonprofit depends on email marketing to drive subscribers and customers back to your organization time and time again. But what if your emails aren’t producing the results you’re looking for? How can you design emails that are impossible to ignore and drive real action from your subscribers? Get access to professionally-designed email templates with a Constant Contact account. Sign up for a free 60-day email marketing trial here. First, how do you know that you’re not already getting great results? It helps to have a benchmark to work with, so keep our Average Industry Rates chart handy to give you an idea of what kinds of open rates you should be shooting for. Next, let’s talk about how to design emails that spur readers to action. Just like in conversation, no one likes being talked at. You want to talk with someone who is in tune with your interests and appreciates your input. Similarly, when you write content for your emails, you want to align your message with the interests expressed by your subscribers. 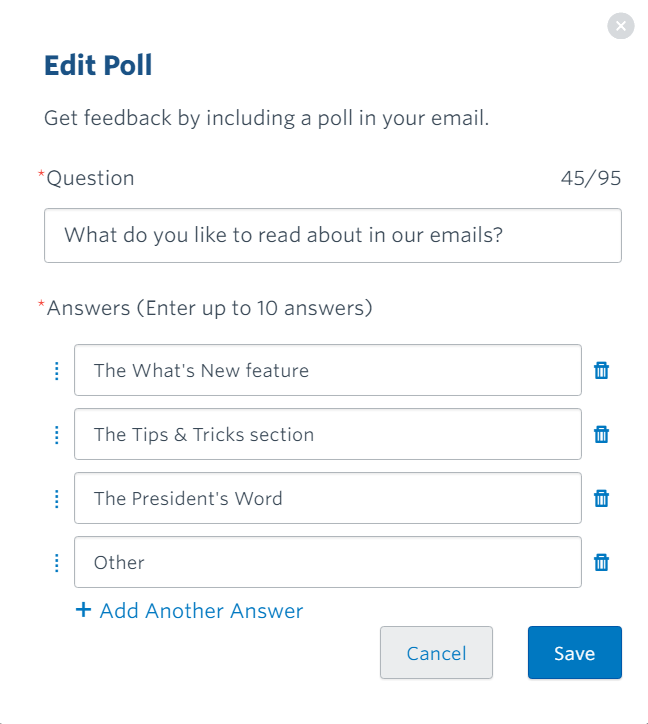 Take Action: Include a poll in your next email to ask subscribers what topics interest them. Your report will show you the results of the poll and help you tailor your email content according to your readers’ interests. Note: Our Poll feature is available in our Email Plus package. Contact our Support team to get set up. Your subscribers don’t hate to read, they just hate to read a wall of text every time you send an email. According to a Constant Contact study of over 2.1 million emails, emails with 20 lines of text or less result in the highest engagement. Don’t make your readers endlessly scroll. Instead, keep your content concise and link off to any longform content. Take Action: Encourage readers to take action and read what interests them outside of your email. By adding a Read More block, subscribers can click a button to read an entire article. You can tease the first sentence or two of an article, and then ask your subscribers to click to read more of it. You’ll reduce frustration and increase your open and click-through rates as people get used to skimming then selecting the information they want most. Think about how you format your emails. Do you pepper links to articles, videos, or landing pages throughout the email? If you do, you could be confusing your readers with too many options. Instead, select a link that is the most important for subscribers to respond to and feature it prominently near the top of the email. Take Action: Use a button or create white space around a link to make your link pop with a clear and compelling call-to-action. Always make it obvious what you want your readers to do and use a button to make links easy to click, even on small screens. A little variety is good, but if you tend to select a different template each time you sit down to write an email, you could be turning your subscribers off with an inconsistent look and feel. Keep it simple for you and for your subscribers by following the key elements of email design. 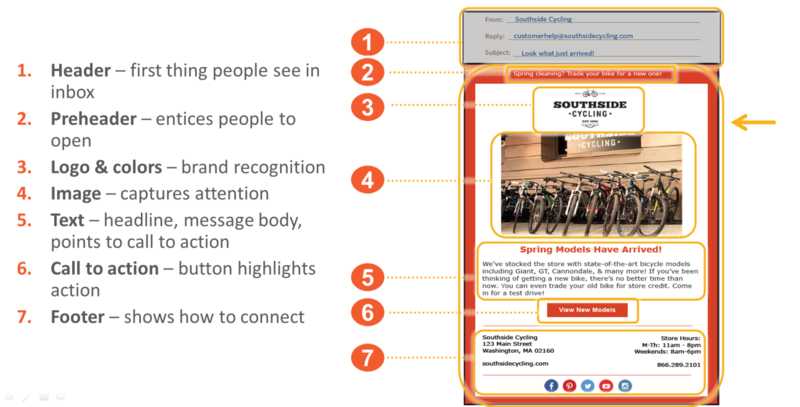 Take Action: Design a reusable template using the seven elements of email design featured below. Your look will be professional, consistent, and will inspire subscribers to take action. Once you start to master these design best practices your emails will inspire more action from your subscribers. Your subscribers will appreciate your consideration for their time and respond to your clear and well-designed messages. You’ll also start to create emails — like the one below — with less time and effort, too! 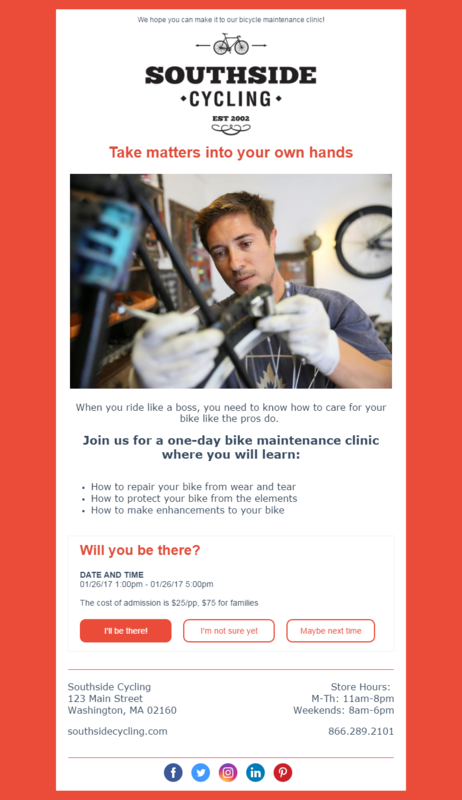 Design an action-driving email of your own! Sign up for your free 60-day email marketing trial. Already have an account? Put these tips to work!